Nicholas Parisi's new Rod Serling book was released today. Author Nick Parisi calls it "a storm in Cincinnati." His new comprehensive look at Rod Serling's TV scripts includes the most detailed examination I've ever seen on Serling's drama scripts for The Storm on Cincinnati's WKRC-TV in 1951-52, eight years before CBS debuted his iconic The Twilight Zone. Full disclosure: I helped Parisi research Rod Serling: His Life, Work, and Imagination by looking up early 1950s TV columns in the Cincinnati Post, Enquirer and Times-Star on microfilm at the downtown Public Library of Cincinnati and Hamilton County. He first contacted me nearly three years ago. 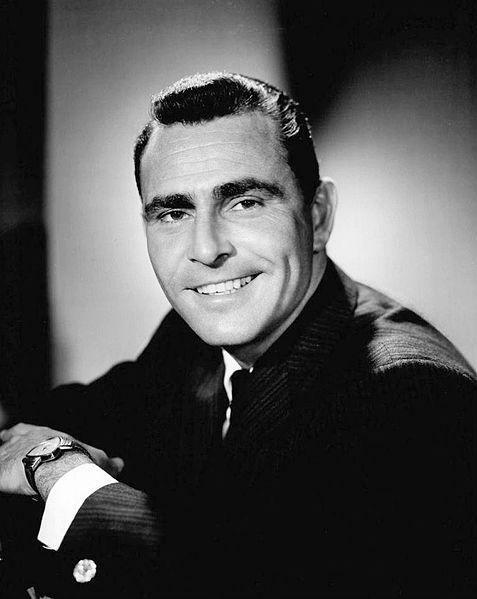 CBS' Rod Serling publicity photo for 'The Twilight Zone' before the series premiere in 1959. Serling wrote for The Storm -- the city's only live, half-hour drama -- as a freelancer in the evenings after coming home from writing everything but drama (travel shows, sitcoms, skits and "continuity" patter Midwestern Hayride, Melody Showcase and Straw Hat Matinee) for WLW radio and television. The Storm debuted in 1951, two years after WKRC-TV became the city's second TV station. At The Storm, Serling first wrote about themes that would permeate The Twilght Zone, Night Gallery and his stories for network TV's live 1950's drama in the Golden Age of Television: About time travel, prize-fighting, prejudice and the horrors of war. The Storm "represents the most significant part of Rod Serling's lost catalog," Parisi writes in the 584-page book, published today by the University Press of Mississippi ($38). It's also available at Amazon. Most of The Storm live episodes are considered "lost" since only one episode ("No Gods To Serve") was filmed – as a sales tool for Taft Broadcasting to convince CBS to air the live dramas nationwide and to find sponsors. When neither happened, WKRC-TV canceled the series after one year in April 1952. 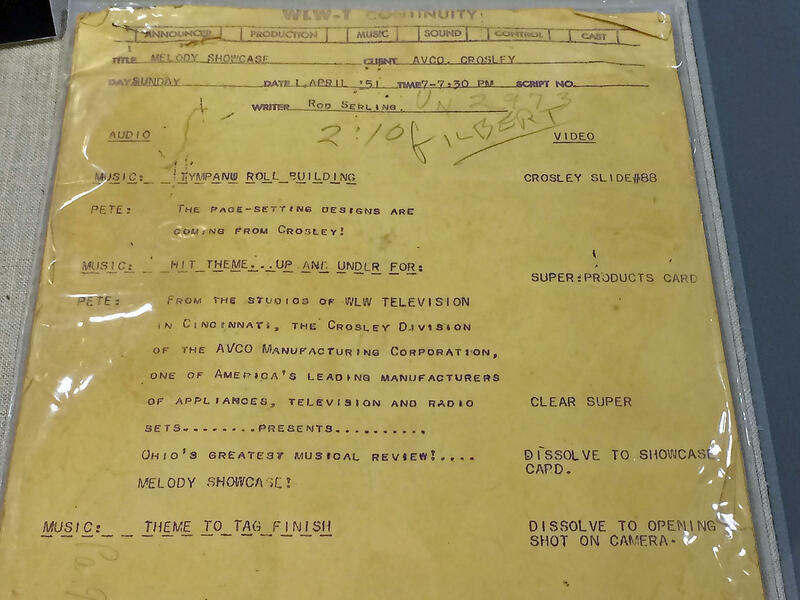 Serling's 'Melody Showcase' variety show script for WLWT-TV on April 1, 1951, was part of Cincinnati's Media Heritage display at the downtown public library in December 2017 through January 2018. Myself and others have written about how "The Time Element," which was 1958 Twilight Zone pilot "Desilu Playhouse" (on Nov. 10, 1958) was written and produced for The Storm in 1951. Serling expanded “The Twilight Rounds,” his 1952 boxing drama, into CBS’ Requiem for a Heavyweight, which won the first Peabody Award for television writing in 1957. “No Gods to Serve” and “Mr. Finchley vs. The Bomb” from The Storm later aired on NBC. But Parisi uncovered one that I – or the rest of the world – didn't know about. Serling wrote his first teleplay about racial prejudice in 1952 for The Storm, a topic "which would have been forbidden on network television," Parisi writes. "It's the first time anyone tried to do it (racial prejudice) on television," says Parisi, in a phone interview from his Long Island home. Called "As Yet Untitled," Serling wrote about racial discrimination experienced by a Chinese man based on a February 1952 news story in which a Chinese man, who had attended college in Indiana, after making a down payment on a home in Southwood, Calif., an all-white, middle-class neighborhood in South San Francisco. The show was produced in April 1952 on The Storm after it was rejected by CBS' Lux Video Theatre. From the very beginning, Serling started writing about controversial topics for The Storm. His first script, "Keeper of the Chair," which had been rejected by several radio series, was about the death penalty – how a veteran prison guard was obsessed with the question of whether he had ever executed an innocent man, Parisi says. Parisi, who represents clients seeking Veterans Administration benefits or Social Security disability, visited Serling collections at New York's Ithaca College, and Wisconsin Historical Society, and at Antioch College in Yellow Springs, OH, where Serling studied language and literature. After Serling and his wife Carol graduated from Antioch on June 24, 1950, they headed to Cincinnati where Serling started his professional writing career at WLW. Serling quit WLW in December 1951, and continued to freelance for the live network TV dramas from his home on Long Lane in Springfield Township. The Serlings moved to Connecticut in 1954, and then to Los Angeles before The Twilight Zone premiered on Oct. 2, 1959. Serling died too young at age 50 on June 28, 1975. He wrote over 250 scripts for film and television, including Patterns (1955), Requiem For A Heavyweight (1956), The Comedian (1957), The Twilight Zone (1959-65), The Loner (1965-66), Night Gallery (1970-73) and co-writing the original Planet of the Apes (1968). 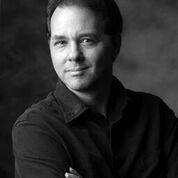 He won an unmatched six Emmy Awards for dramatic writing for four different series. Parisi did not come to Cincinnati during his four years researching and writing Serling, but he's trying to arrange a book signing here before Christmas. And he might come back next year to see his favorite baseball team, the Cincinnati Reds. "I've been a Twilight Zone fans since I was 10 years old," Parisi says. "Slowly and surely, I became aware of all the stuff he had written. I just admire the hell out of the guy – his philosophy and his world vision. He is one of my heroes." Rod Serling's first Cincinnati TV drama, "The Keeper of the Chair," aired on WKRC-TV's "The Storm" drama series 65 years ago, on July 10, 1951.